Treat mom and kittens at the same time to remove those pesky fleas. Fleas can infest a mother kitty and her newborn litter, especially if you've recently rescued them from the outdoors. These pests cause anemia and other diseases in your furry friends. Unfortunately, you can't apply many flea remedies available to such young kittens and you'll need to remove the fleas manually. While many topical and oral flea medications can eliminate fleas in kitties, even little ones older than 4 to 8 weeks of age, they can't be used on those only a week old. Another concern is the mother, because many medications aren't safe for use in nursing moms. 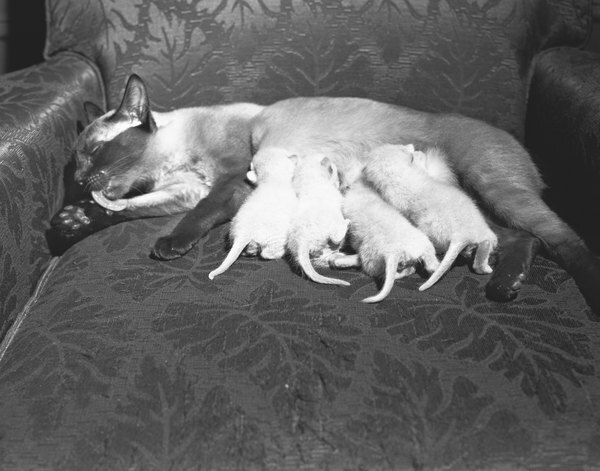 Certain insecticidal medications may adversely affect a mommy cat's kittens through her milk. There are oral ones, though, such as chewable tablets containing the ingredient nitenpyram, that are safe for mom and will kill all of the fleas on her only. Some other topical flea treatments containing ingredients such as selamectin or fipronil are also considered safe for use on nursing mother cats. 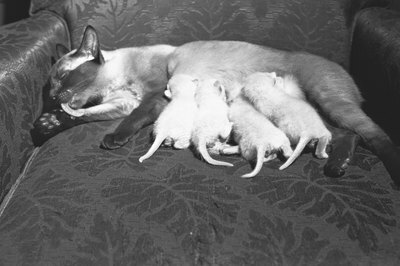 Before using any medications with the mom, consult with your vet to ensure it is safe for nursing kitties. While mom can be treated with a topical or oral flea preventative, her babies can't. To get these blood-thirsty pests off of these little guys, a good bath using simple dish soap, which doesn't contain harmful insecticides, can rid them of the fleas and wash them away, recommends the NYC Feral Cat Initiative. Simply soap the little babies up in your kitchen sink with some comfortably warm water and a small amount of dish soap. After a minute or two, rinse them off gently with warm water. Avoid soaping up or rinsing their little faces and use a damp wash cloth to wipe their faces clean instead. After bathing, gently towel dry them. Set them on a towel over a heating pad so they won't become chilled while they dry. Clean all the babies one after the next so that any unbathed ones won't reinfect the others with fleas. Use a flea comb to remove fleas from both mother and babies either prior to or after a bath. These combs have very closely spaced tines that help grab the little fleas and their eggs from your kitty's fur. This can be a time-consuming project, but if you carefully comb through both the mommy kitty and her babies' fur, you can remove all of the fleas from their coats. Because the little ones are so small, you may also need to use a pair of tweezers to pluck away fleas from their sensitive areas, such as their faces and backsides. Dunk any fleas you find into a glass full of rubbing alcohol or soapy water to kill them. Fleas can become a very serious problem for newborn kitties because of their small size. These little ones can quickly become anemic if not treated for fleas. Bring both mom and her babies to the vet for a health check so he can determine if they require any additional medical care to alleviate any medical issues caused by the fleas. He can also give you some recommendations on safe ways to remove the fleas from both mom and babies. If you're not comfortable with bathing the little guys or the mother, he can also do so in the office to safely remove all of those pesky fleas. In addition to removing these fleas from the kitties, vacuum your home carefully and wash all of the bedding for your furry friends to get those fleas out of their environment, too. VetInfo: Can I Use a Flea Treatment on My Pregnant Cat?